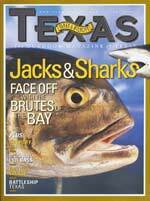 TPW magazine | Archive - June 2005 - Tackle Box or Treasure Chest? Tackle Box or Treasure Chest? While some antique lures can be valuable, most collectors see them as cherished artifacts of a beloved sport. Those words constantly ring in my head every time I think about the treasures that I lost, destroyed or threw away as a kid. I can still remember it as if it was yesterday. I was 7 or 8 years old and my dad and I were cleaning out the garage one morning when we came across an old wooden box. “Do you know what this is?” he asked with a gleam in his eye. “No!” I responded spitefully as I walked away, still ticked off that my weekend was being consumed by something as trivial as cleaning. The rest of the morning I intently helped my dad while he told me stories of how my grandfather would take his old wooden johnboat and his tackle box, both of which were made with his own two hands, and go down to the Laguna Madre and come back with enough fish to feed the family. After the chores were done and we finished a fine lunch of grilled-cheese sandwiches, tomato soup and iced tea, my father sat me down in the lawn chairs on the patio, and he went back into the garage. Shortly thereafter he came out with that old green wooden box. As I rooted through what I would realize later in life was a treasure chest, my dad continued to tell me stories of the grandfather I never knew. Sometime later that day, while I was playing with neighborhood friends, my dad hid the box away from my reach. It was one of the biggest favors he ever did for me, although he may have never known it. In retrospect, though, I wish he would have locked it away and lost the key. You see, he knew then what I know now — appreciation comes with age. A few years passed, but I had not forgotten about that old wooden box full of lures, worms and bobbers. When I was finally big enough to start snooping where I should not have been, much to my detriment, I found it. And, thinking at the time how smart I was, I would take a lure or two here and there, always making sure I left the box the way I found it, hidden away by my dad years before. As the years went by, the contents of that old box slowly disappeared. But for fear of punishment if I ever got caught, I never moved the box. Thankfully! I can still remember the last thing that I took from it. I was probably 13 or 14 and I was heading down to the pond behind Old Man Fredrick’s lake to meet some friends for an afternoon of bass fishing. I did not have any plastic worms and then remembered where I had seen some. I stood on the seat of my dad’s motorcycle and reached up over my head, into the shelves and under the tarps where he had hidden it. I carefully lifted the lid and stuck my grubby little hand in there to retrieve the last piece of treasure. It was a package of four Boone’s plastic worms. I remember it vividly because the worms were bright yellow (a color of plastic worm that I have not seen since, by the way). I quickly hopped on my bike and was off, with my fishing rod in hand and the worms in my pocket. Happy to be the first to arrive because I would get first pick of the few open areas to cast from, I quickly started rigging my rod. Now I do not exactly know how I remember this, but I do and am glad for it. That day, for some reason, I rigged one of those yellow worms Texas style, but without a weight. On my first cast of the day, I tossed the worm out to a grass bed just offshore and started working it back just under the surface. When the worm was about halfway back, I saw a green flash in the clear water, and I reared back. The hook set provided me with a great show as the bass leaped several times, flaring its bright red gills and shaking its head. Moments later I lipped the 5-pound bass and stared at the yellow worm wondering what the heck that fish thought it was. Shortly thereafter my friends arrived, and we fished until dark, but we did not catch another fish. Incidentally, a few days later I went back with the three yellow worms that I had left in my pocket to try to fool another bass. I was riding down the bike trail through the woods that led to our little honeyhole only to notice that the dark trail had an unrecognizable bright light at the end of the tunnel. I pulled my bike up next to my buddies, and we watched in horror as a bulldozer pushed dirt into our pond. And, now someone’s home is built on our beloved fishing hole. I realize now that one of my grandpa’s yellow worms, purchased long before I was born, probably caught the last fish ever out of that pond, and I often relive the memory of that yellow worm wriggling just under the surface only to disappear into that fish’s mouth. I’m not real sure what happened to the 3 yellow worms that did not get used on that dreadful day that “progress” took away the first of many childhood fishing holes. But, I keep hoping that I will find them in a junk drawer someday. As for the box that those crazy-colored worms came from — knowing that I had taken all that it had to offer, I did not see it again until some 15 years later when my dad passed away, and I went right to the spot where he had hid it from me. It is now one of my most prized possessions and occupies a space in my bedroom, where it holds a few old lures that I managed not to lose and some old reels that my father was able to keep hidden from me. Sadly enough, I could go on forever about losing old rods and reels and tackle — stuff that, had I held on to it, would be worth some serious scratch these days. Nowadays I am constantly on the lookout for old tackle to collect, though I could hardly be considered a collector. The bulk of my stuff consists of my grandpa’s tackle box with a couple of well-used lures, my dad’s reels and a nicely framed collection of Bingo Baits that good friend and collector Ben Kocian gave me as a gift (another prized possession). Kocian, best-known for his talent as an artist and illustrator as well as for his tireless work with the Coastal Conservation Association, is probably one of the biggest collectors of old, rare and antique tackle in Texas. He got started back in 1990 when a friend, Lee Richter, gave him his collection. At the time, he was not interested in another hobby but accepted the gesture. Now, some 15 years later, the hobby has become an obsession. And he doesn’t just collect the tackle — he also loves to go out and fish with the stuff. When we arrived at the lake, I expected him to pull out a more modern rod and reel and a small box of old lures. However, he came walking down to the boat carrying a couple of old bamboo rods matched with some mint-condition, antique, level-wind reels and an old wooden tackle box. He wore a smile much bigger than his face, and I knew he was already having a great time. As we worked down the shoreline, I was in constant awe as I watched him cast the old direct-drive reel (unlike more modern reels, the handle does not disengage and spins during the cast), tossing the small wooden plug to shoreline with amazing ease. We hadn’t made it too far when the plug got toilet-flushed by a largemouth. I have to say that the bend in that old bamboo rod was a sight to behold, and I could not help but think how far technology has brought us. But regardless, Ben was having a blast. As the day came to an end, Kocian experimented with, and caught a few fish on, other lures, but he always seemed to come back to that little copper colored plug. He later told me that it was a plug made by South Bend Lure Company called a Midge-oreno. “If they’re hitting on top, it gets ’em every time,” he added. Lures by South Bend are pretty popular among collectors; however, Kocian’s collection goes way beyond that. Lures made by popular tackle companies such as Heddon and Creek Chub are a major part of his collection. His favorite collectibles, though, are lures made in Texas by Doug English (later known as Bingo Baits) that were being made as early as the ’40s and ’50s and Nichols Shrimp and Perch that date back to the ’30s. When asked what the oldest lure in his collection was, Kocian produced an old spoon-like bait made by the J.T. Buel Co. near the turn of the century called a Buel Spinner. It was wild to hold a piece of tackle that was made before my dad was born, and maybe even before my grandfather’s time. As for his favorite, he says it’s the copper-colored, mint-condition bait made by Shakespeare called the Egyptian Wobbler. When talking tackle with Kocian, it is evident that he truly loves what he is doing. Over the years I have learned a great deal about collecting from him. For instance, the worth of a lure isn’t always determined by how old it is. Condition and rarity of color play the most significant role in its value. I’m also learning that it is not too late to get started collecting. There are tons of treasures lying around in people’s garages, attics and basements just waiting to be discovered. Another great place to search for old tackle is at flea markets. For those interested in collecting, Kocian recommends that you attend an antique lure show or pick up any one of a number of books on collecting. The information to be learned from these sources will give you guidance as to what to look for and what certain lures are worth. He also recommends that if you are not interested in collecting but have some old tackle stowed away somewhere, give a collector a call. “Yeah, like me,” he answered. Well if you do try to contact him and cannot find him, chances are he is snooping around a garage sale or flea market looking for the next piece of treasure.